This book is a wonderful treasure trove of Lao folktales told by Lao people and translated into English. Many are classic well-known stories and others may be not so well know. There are also some stories from different ethnic groups in Laos (ex. Lao Phuan) and stories from Thai Isan (formerly Lao territory) region. 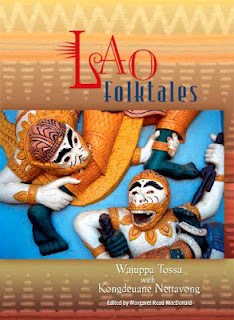 Surprisingly, the book also includes chapters on topics such as Lao food, crafts and games. Out of all the Lao story books I've bought this would be one of the more larger and definitive ones indeed. I highly recommend this book. And I've included the table of contents just for your info and just because I think it's so interesting the amount that's covered. The author, Dr. Wajuppa, is from the Thai Isan region (which is formerly Lao territory) who identifies with both Lao and Thai culture. She researches extensively in story telling and literature in Southeast Asia. Ms. Kongdeuane is Director of the National Library of Laos and hails from northern Laos and is of the Lao Phuan ethnic group. Thank you for your kind comments. We hope you keep visiting our site.